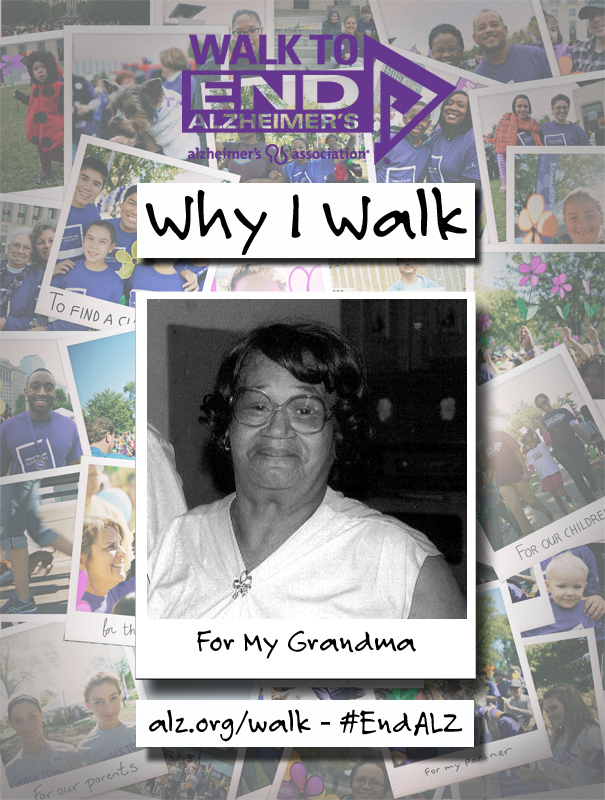 My name is April Toliver and I Walk to End Alzheimer’s in memory of my maternal grandma Georgia Woolfolk-Nelson-Williams. I remember as a small child going to visit my Nannie, as I fondly called her. She was always so happy and full of life. She was a very strong, god-fearing woman that left her footprints in many hearts along her journey. She was a loving mother of 7, grandmother of 23, great grandmother, sister, aunt and great aunt. I lost my beautiful Nannie in 1992 when I was only 12 years old. I cherish the little memories I do have of her. I so vividly remember my peanut butter and jelly sandwiches she fixed me for lunch (I absolutely love peanut butter now, I often wonder is that just my way of holding on to her); or the all the little nursery rhymes, children songs and games she taught me (Annie-Over-Here She Comes). So imagine a few years later that this same loving woman doesn’t even remember your name. She doesn’t recognize you. She thinks you’re some neighborhood child coming to hug her. Aren’t Nannies supposed to be your best friends? Who’s going to play with me and fix me peanut butter and jelly sandwiches? She lived in a disoriented world, where the simplest words and names of family members and friends escaped her. She became aggressive and combative toward loved ones. Some can remember people and events that occurred in the past, yet they have no idea what they did or ate a few minutes ago. The worst part about this disease is slowly, over time, you watch your loved one leave you. I was robbed of many other memories due to the horrible disease and I miss her more now as an adult than anyone could possibly imagine. Please join me in the fight to #ENDALZ. You can now register for the 2015 Walks to End Alzheimer’s! NOTE: Pre-registration required. Pre-register by calling 540-370-0835 or e-mail lori.myers@alz.org. NOTE: Pre-registration required for all programs. Pre-register by calling 804-967-2580 or e-mail fran.foster@alz.org. Please call Carolyn Costello, 804-615-1117, for more information. Please contact Ted Leonard, 804-642-9189, for more information. Please contact Barbara Swain, 804-832-1571, or Lisa Jones, 804-695-9008, for more information. Please call Ellie Galloway, 804-695-9382, for more information. Respite care available with reservation. Please contact Ellie Galloway, 804-695-9382, for more information. Please contact Jill White, 804-695-7290, for more information. Please contact Lori Myers, 540-370-0835, for more information. Please call the Chapter Office, 540-370-0835, for more information. Please contact Judy Scheibe, 540-898-1378, for more information. Please call Jessica Samet, 804-967-2580, for more information. Please call Edith Byrnes, 804-271-4441, or Sharon Condrey, 804-590-9305, for more information. Please call Bob Junod, 804-752-2219, for more information. Please call Blanche Castelow, 804-748-5585, or June Gilliam, 804-748-6668, for more information. Please call Wanda Hunt, 804-305-8394, for more information. Please call Lynda Gormus, 804-320-0619, or Erin Davidson, 804-514-2142, for more information. Please call Vivian Bagby, 804-321-1649, or Barbara Allen, 804-782-1942, for more information. Please call Bob Schaefer, 804-310-7991, or Leigh Hilldrup, 804-839-0236, for more information. Please call Mary Ann Johnson, 804-967-2582, for more information. Please call Nancy Lentz, 804-967-2586, for more information. Please call Merle Kahn, 804-967-2575, for more information. Please call Blanche Castelow, 804-748-5585, or Edith Byrnes, 804-271-4441, for more information. Please call Jacki Page, 804-321-2573, for more information. Please call Connie Tucker, 804-241-2056, for more information. Please Call the Chapter Office, 804-967-2580, for more information.